Fixed an issue that could happen in OS with different locale. 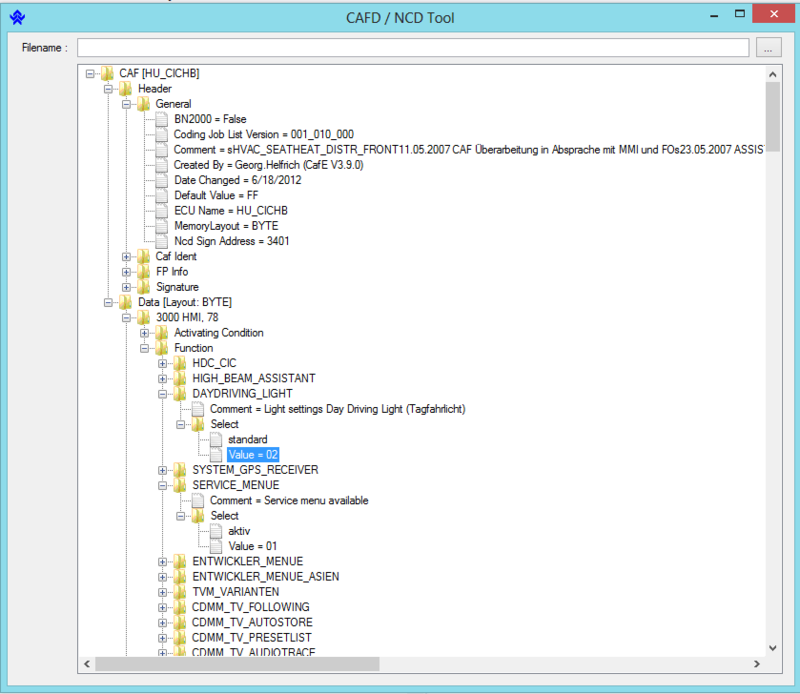 You have this issue if you get the message: "Data at the root is invalid"
If you have customized the settings, don't overwrite "NcdCafdTool.exe.Config" or your settings will be replaced. Open "NcdCafdTool.exe.Config" with Notepad, copy the value of signatureKey node, then open the application, go to Settings and replace the Signature Key. You can also edit your config file with Notepad. - Fixed issue with "Search"
I started writing this tool a couple of hours ago, very rough in its current stage but could be developed further and make it smoother around the edges a bit. 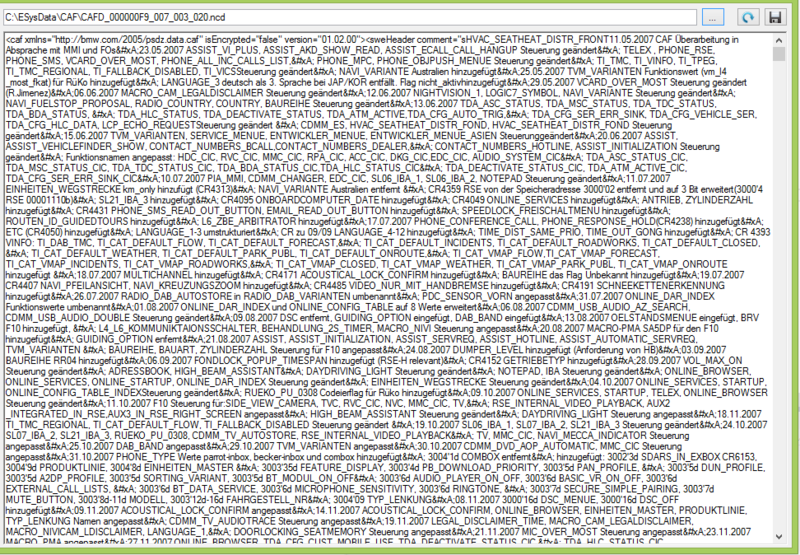 Currently, the only thing this tool does is decrypt CAFD and present it in tree view, nothing else. What's interesting is that names are mostly in English, so, the non-German tongue among us, could readily understand it. I've been talking to Shawn several weeks back on a related tool and this could be the start of it. 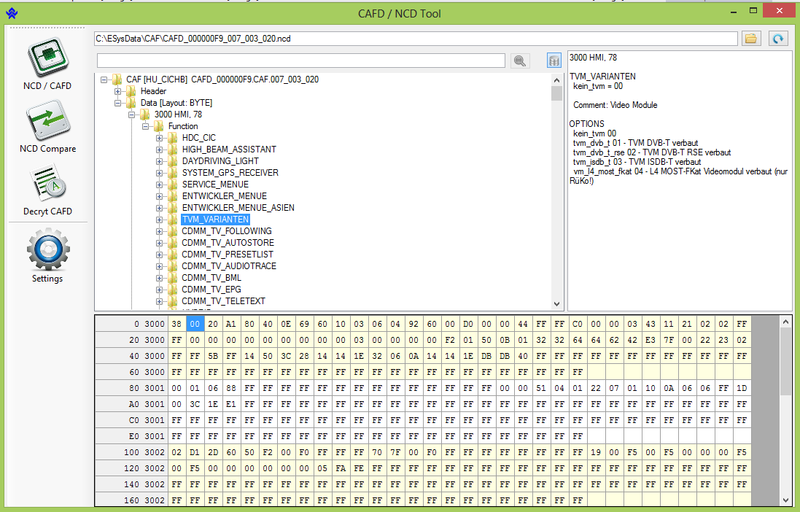 This tool can lead to comparing between two NCD files, or even NCD to CAFD, or CAFD to CAFD files. Anyway, before I get ahead of myself, just wanted to see if anyone is interested in this type of tool. I can develop it further, elicit some ideas, and release it to the community - free of charge. Note: I'm contemplating if I should make this open source, but since it entails decrypting CAFD using the maker's private key, I'm not sure if this is a good idea. I think a tool like this would be infinitely valuable to be able to search for codes and for comparing what settings are changed when different VO options code are changed. For the German names and comments, could you also add an interface to Google translate (or something similar) so that this text could be shown in both the original form, and in whatever language the user prefers? In-place translation is kind of out of the table right now as the translation API is for-fee service, but a link to G is definitely doable. 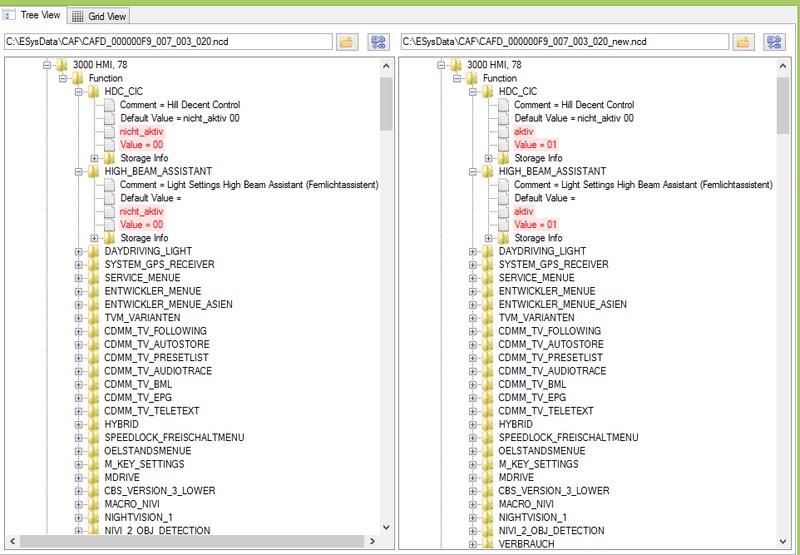 I find it amusing that the CAFD files are about 80% English in its raw form -at least the DME CAF. E-Sys does on-the-fly translation to German, even if English is selected as a language. I guess this is a bug, but I don't know. Seems to be quite an awesome idea. Especially a comparison mechanism for files. I think the Google Translate option would be quite useful too. I am sure there must be some translation API available 'free to use' somewhere. Sounds like an awesome idea, currently I use Beyond Compare with NCS FSW.TRC files which is a fast way of seeing what options change in the coding of a module when you you code it based on different VO's. Being able to compare the coding of a CIC with or without COMBOX for example would be very useful. Update: NCD parsing and injecting into CAFD is done. Next is adding the compare and search feature. UI will probably look side-by-side/left-right panel, with visual difference indicator. I noticed that the entries are not sorted. I did made a sorted version but I thought I'd do what E-Sys does. Anyway, this can be easily added as user configurable setting. On the translation, Bing has a free-to-use model but is limited to 2M characters per month. Maybe it's good enough for now. BTW, just like E-Sys, when opening an NCD file, it will determine and open the corresponding CAFD file withough having to browse for the file. I am interested as well, that would be an awesome tool! 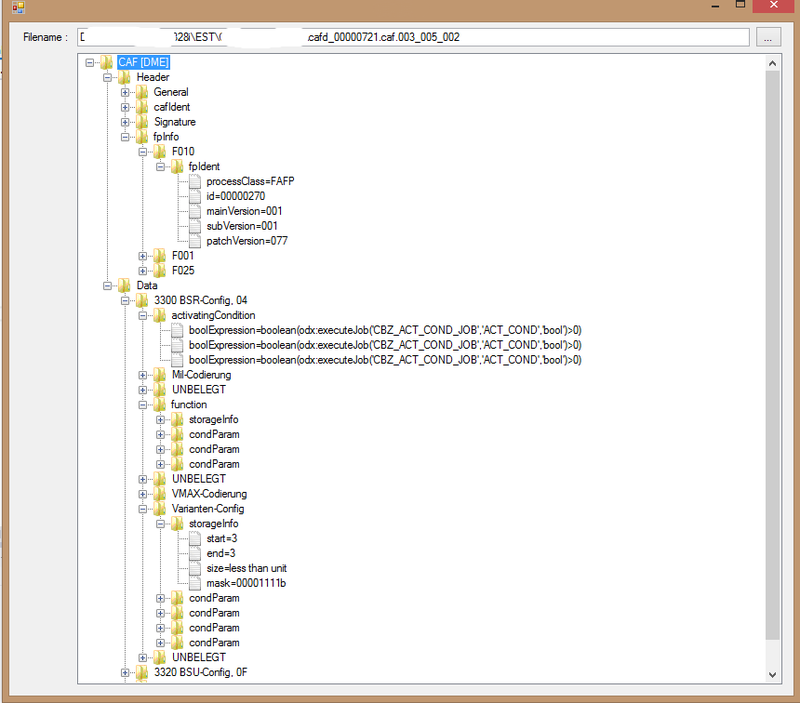 Browseload NCD or CAFD file and it will be presented in the tree view. Button next to browse button is for refreshing/reloading. As you click on the nodes, the grid view will reflect the location of the selected setting within the NCD file. Clicking on the grid will automatically expand the selection and will update the tree view as well. Select right-side file and press "Diff" button next to it to compare it against the left-side file. Difference will be highlighted and you'll aso get a summary of difference in another window. Please send me a link to download and test it. Simple decryptor and export to XML function. I like the NCD Compare functionality a lot. 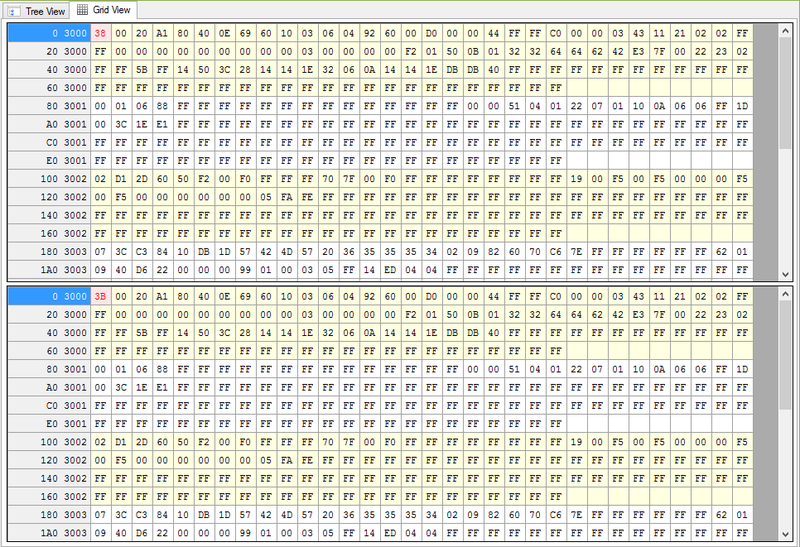 The fact that you can either a) Compare against the Default values, or b) Compare against another .NCD is sweet! I'll check this file and see what's going on but did you have the PsdZ in the default location? I tried it on my home laptop instead of the work computer and it is working fine. Thank you for the tool. Guy -you're welcome and glad to hear it's working now. Just an FYI. The default location on E-Sys 3.18.4 is C:\ESysData, which I still use, but beginning with E-Sys 3.22.5, it changed to C:\Data. I did notice that on fresh install of V3.24, but not on earlier versions. Anyway, changed the default config to just C:\Data now, V0.1.1 Alpha out. I set my PSdZ Location to C:\ESysData and saved it, but nothing is working in this version.